Writer-Director Rodrigo Grande directs this critically acclaimed film about two gangsters trying to adjust to society after spending half their lives behind bars. ROSARIGASINOS (aka GANGS FROM ROSARIO) stars Federico Luppi and Ulises Dumont as Tito and Castor, two thieves who finally get out of prison after thirty years only to find the outside world is not at all like the one they once knew. Trying to fit back in, they seek the help of old gang members and a case of hidden money they stashed away before their incarceration. The problem is, the money has gone missing and their old friends may know why it disappeared. Suspicions run high… Who took their money and how can they ever get it back? 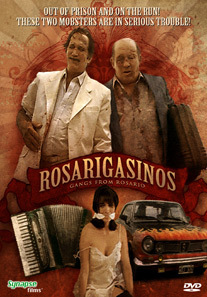 Mix one part THE GODFATHER, one part GOODFELLAS, add a dash of humor and you have ROSARIGASINOS, an engaging and humorous look at the gangster life in Argentina.